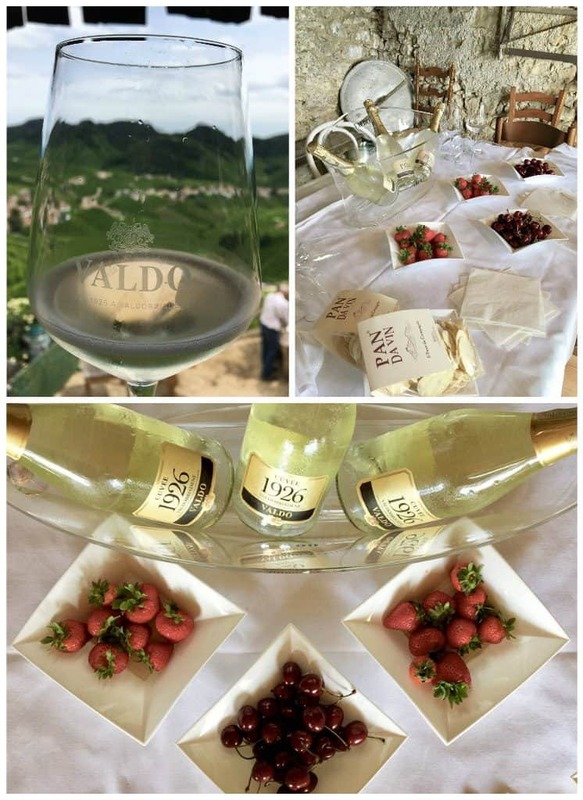 A Day Trip to Valdobbiadene was part of the itinerary from the trip I won from Valdo Prosecco. 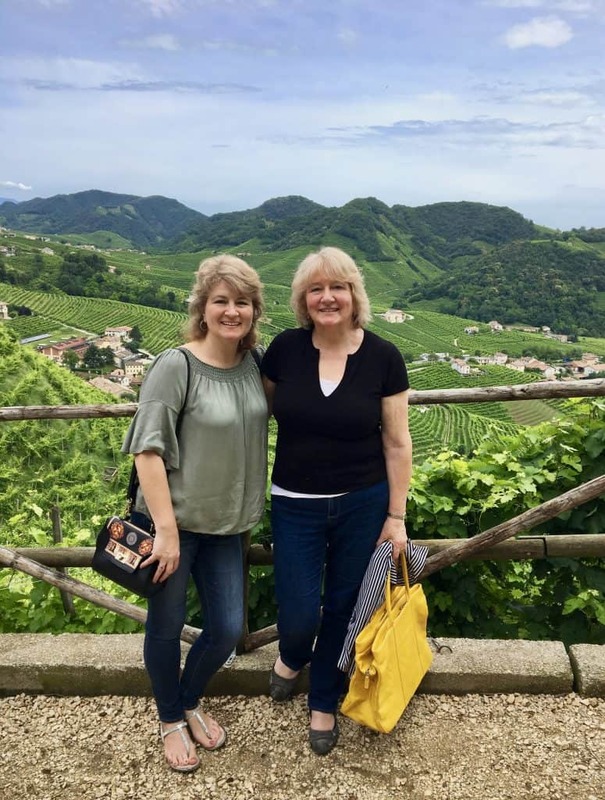 I learned so much about Prosecco and this very special wine growing region of Italy. 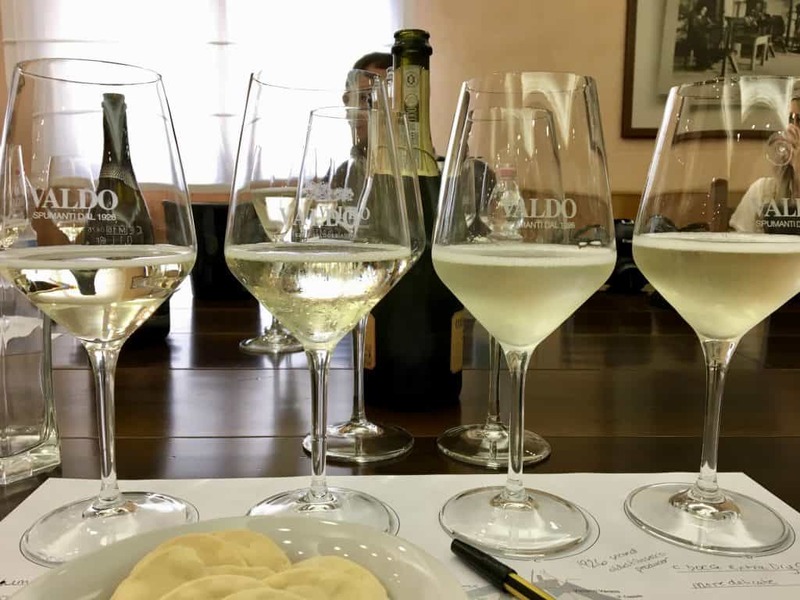 I recently wrote about my time in Venice with Valdo Prosecco. 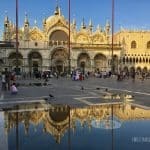 Venice was incredibly enjoyable! I admit, I was really surprised: I had been expecting hordes of tourists, crowded conditions and inauthentic food! Not so, and I could easily have stayed at least another 3 days, even 3 weeks! 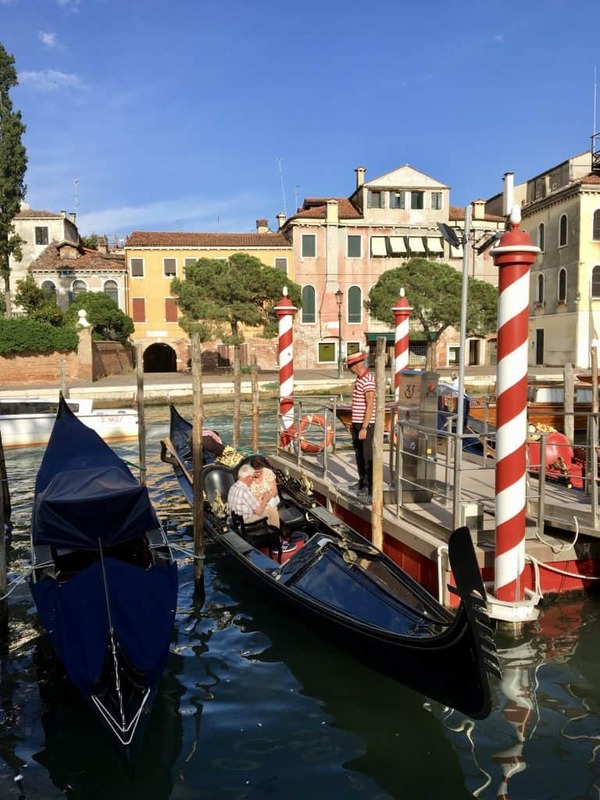 On our second day in Venice, we (my mother and I along with our my co-winner, Chloe Arnold, her husband, Caleb and baby, Cayson) were picked up by water taxi from the Palazzina hotel. We were ready for a day trip to Valdobbiadene. It had rained during the night, so the weather didn’t look very promising. The blue skies had vanished, and the heavy clouds hung low. Our driver was so engaging, we really loved speaking to him on the way to the Valdobbiadene. It only took about an hour and we were already in the foothills of the Dolomites. It seemed a world away from Venice! EDITED: I’m adding this due to Mike’s comment below. During our drive, I had to ask for the umpteenth time, “How do you pronounce Valdobbiadene?” I kept forgetting and mispronouncing it. :( I’m happy to say, I finally got it! It’s now really fun to say. 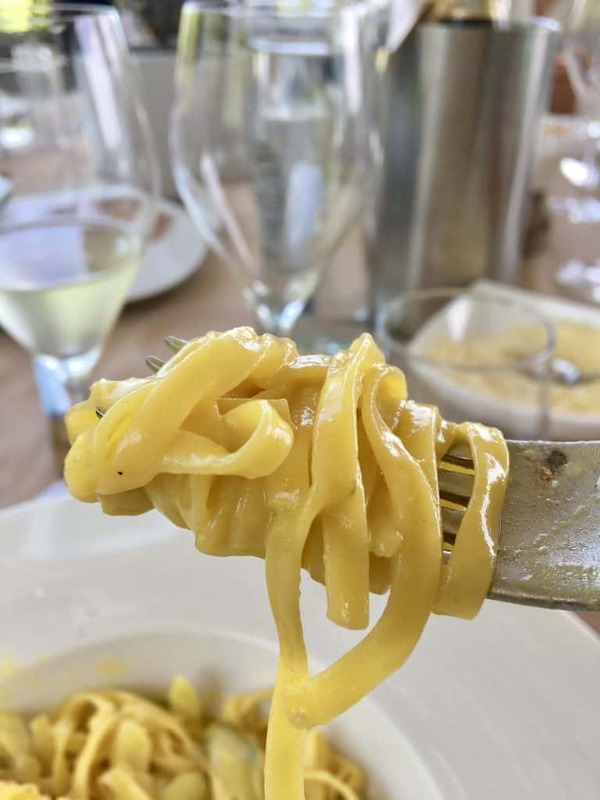 I just kept saying it over and over again, like this: HOW TO PRONOUNCE VALDOBBIADENE. 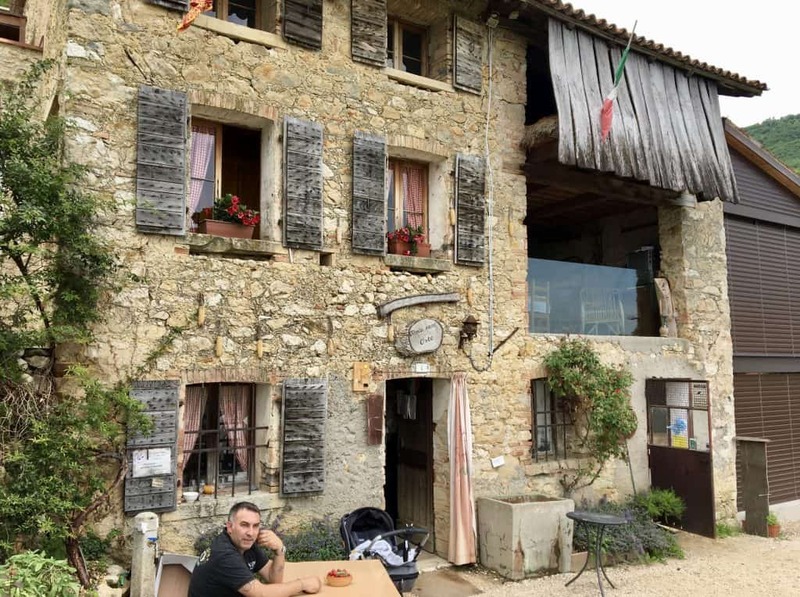 We were met by the lovely Jasmine, and joined by Gianfranco, who is always kept busy keeping tabs on the wine production as the winemaker (director). 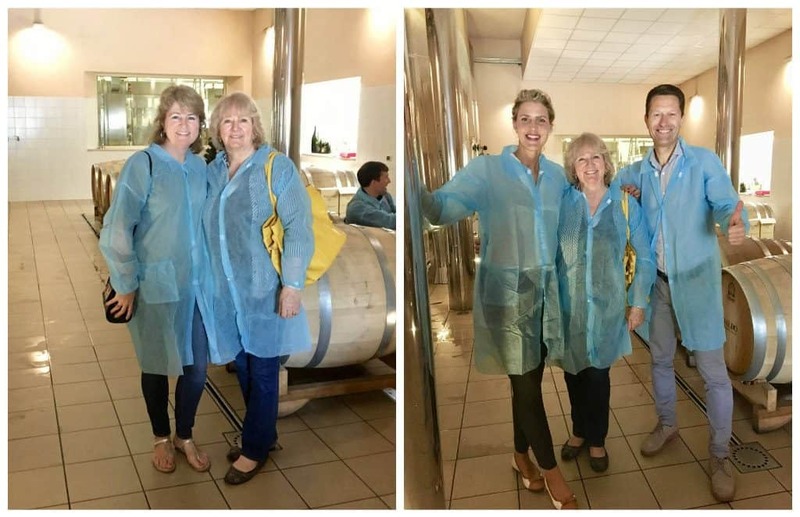 After donning cover ups, we were given a tour of the Prosecco making process which was really interesting. I really appreciate what goes into the process so much more now. What does DOC and DOCG mean? 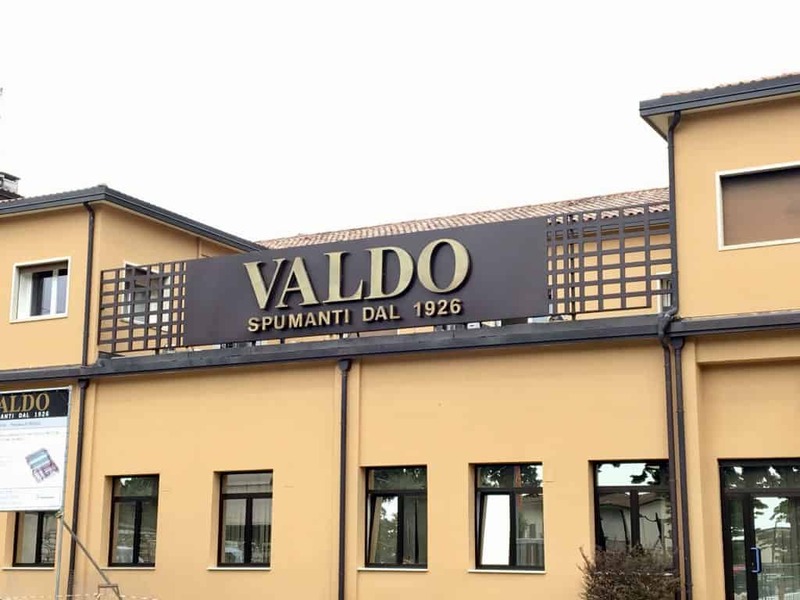 Living in the US, I had never heard of the Valdo brand before seeing their Prosecco contest. 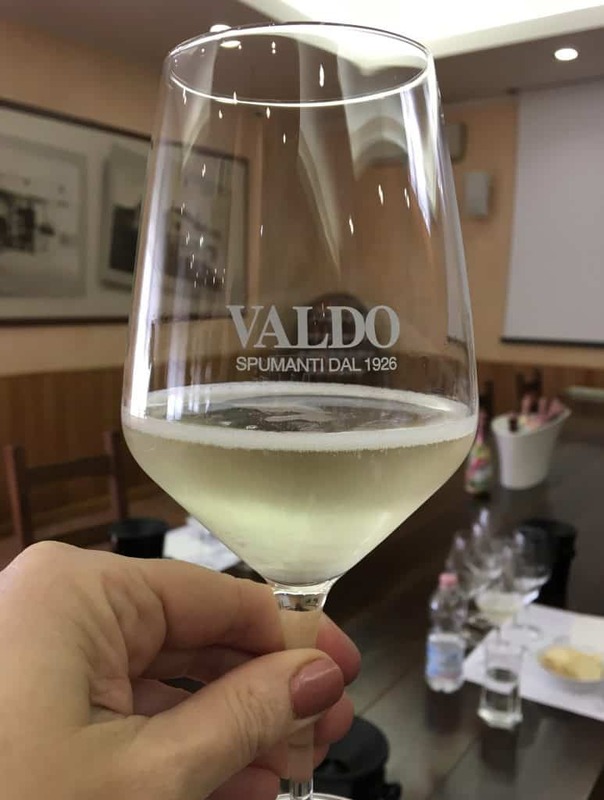 I had no idea that Valdo produced 90 million bottles of DOCG Prosecco and 430 million bottles of DOC Prosecco each year! In case you don’t know about DOC and DOCG, allow me to explain. This will help you in future when you see these marks on other bottles of wine. It also applies to food with labels like DOP and IGP. You probably know I am always getting on my soapbox about quality products and the importance of quality ingredients when cooking. I would guess that this simply comes from being Italian. When you realize how important quality is to Italians and the lengths that the government and companies go to to assure this quality, it makes sense. What is the difference between DOC and DOCG? DOC (Denominazione di Origine Controllata) means controlled designation of origin, which DOCG means the same, but is guaranteed. Products with this label have to be produced within a certain area or region. 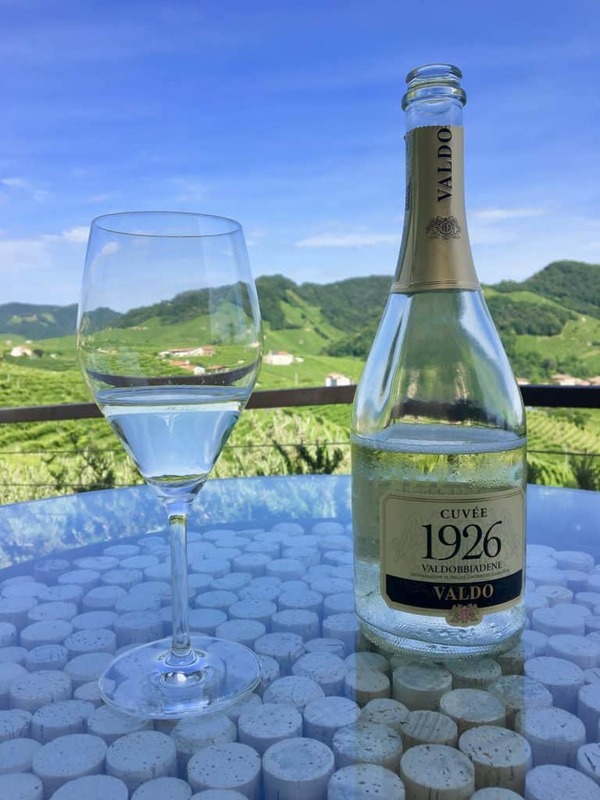 For example, DOC and DOCG Prosecco must have at least 85% Glera grapes grown in a certain part of Valdobbiadene. However, the DOCG wine has even more strict applications and can only be grown in an even smaller area. 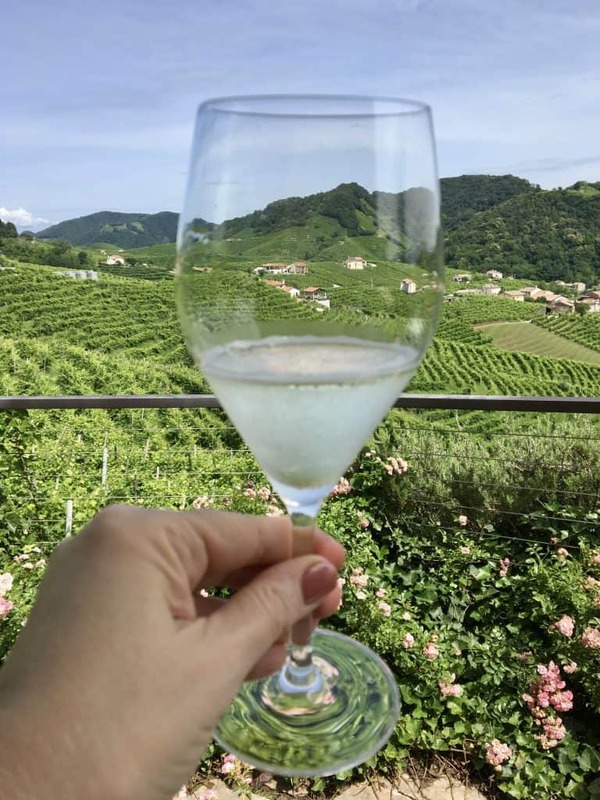 Prosecco is not made from Prosecco grapes, as one might assume. 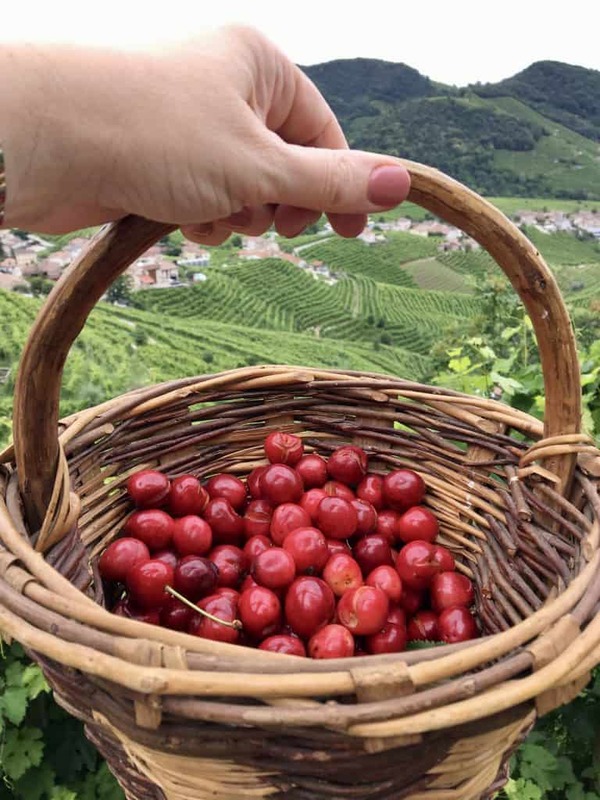 As noted above, the Glera grape is what is used for Prosecco. Essentially, DOCG ensures the top quality wine; the best of the best. Furthermore, IGT (Indicazione Geografica Tipica) meaning “typical geographical indication” is basically a level below DOC. It’s a more recent classification for wines that are almost at the DOC qualification, but not quite. 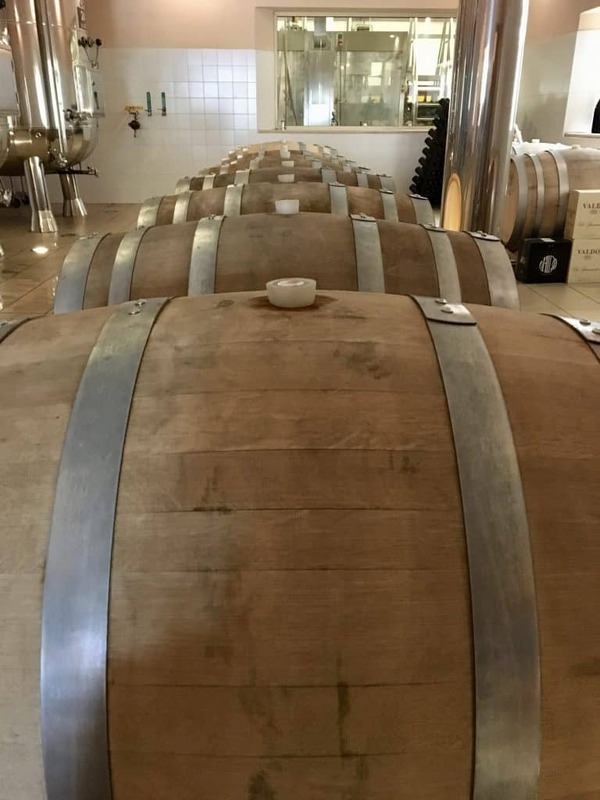 Suffice it to say that an easy way for us to know that we’re getting a good product, or an even better product, is to look for these quality labels on our Italian wines, whether it’s Prosecco or not. Next, it was Prosecco tasting time! At this time, Paolo, the Export Manager at Valdo, took time out of his busy schedule to join us. He and Gianfranco led the wine tasting and explained so much about the different Proseccos that are made at Valdo. We tasted 6 varieties from Numero 1 a DOC variety to Numero 10 DOCG which is made with 100% Glera grapes. 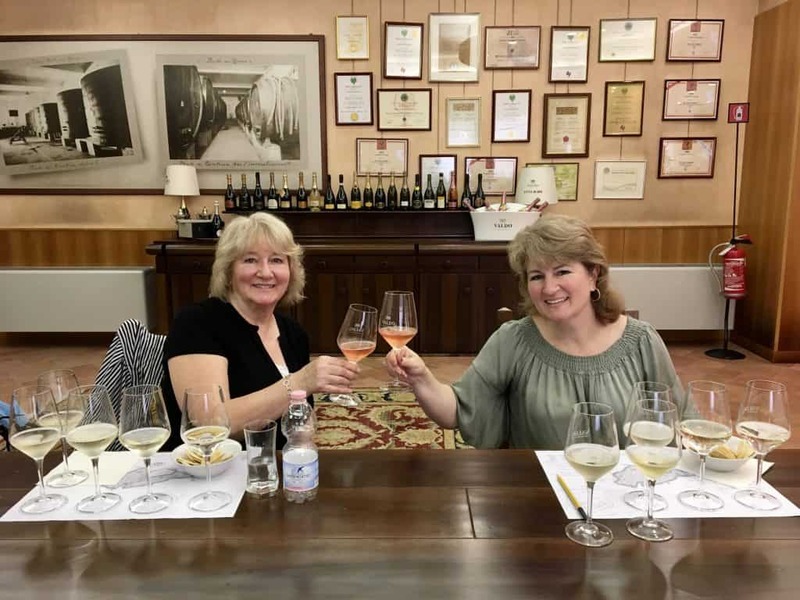 The Rosè Brut was my mother’s favorite, while I found myself really enjoying the flavors of the 1926 DOCG. Although, I can’t say there were any we didn’t enjoy! If you’ve never tried Prosecco, you’re missing out. It’s a wonderfully refreshing, and delightful sparkling wine, with such fragrances and flavors of stone fruits, honey, and pear. Prosecco is a great wine to pair with food, but also lovely as an aperitivo, with or without nibbles. Paolo and Gianfranco explained that despite all the rage of using tall flutes for sparkling wines, the best are actually wider, like these tulip shaped glasses. This allows for the aroma of the wine to be enjoyed more fully. 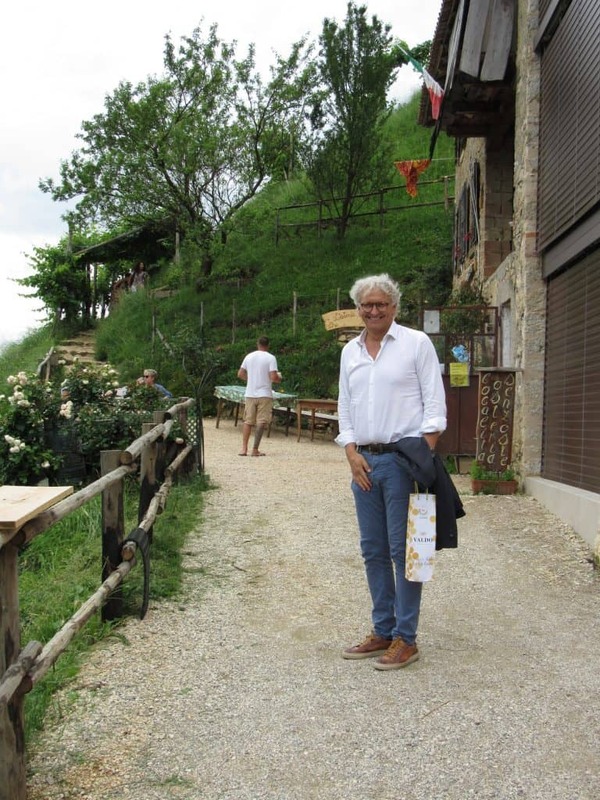 Visiting the Valdo Vineyards in Valdobbiadene. After our wine tasting, we were off to the vineyards. The clouds were persistent, but at least the rain stayed away. Gianfranco gave us some really interesting facts about the vineyards. 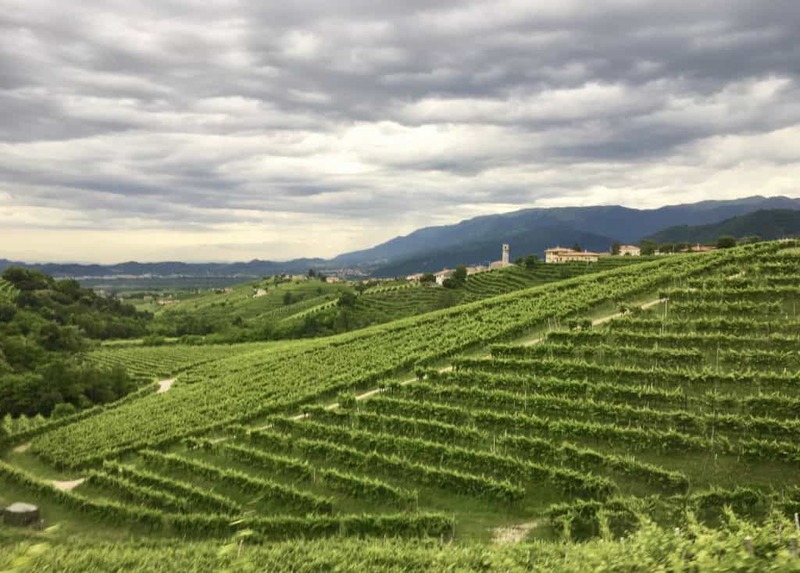 For example, one side of a hill could be designated for DOC production while the other side is DOCG (due to sunlight and other factors). The criteria for these labels are so strict, and they are held to the rules. The vines and property rarely are sold or change hands as they are so valuable and coveted. Most of the vineyards have been passed down from generation to generation. The people who work for the wineries are handpicked, much like the grapes. 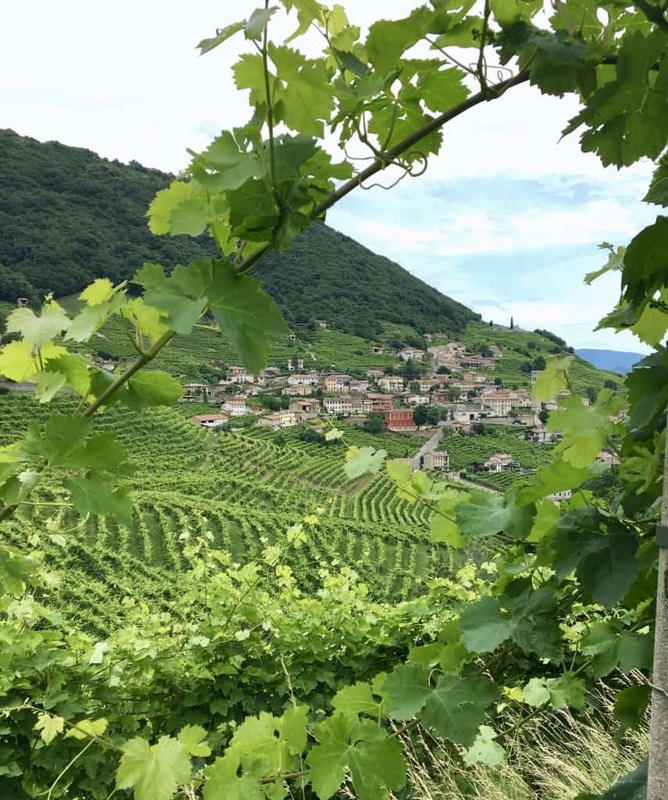 They have to really know the terroir, how to work with the particular grape variety, and they must be educated how the weather affects the vines, and much more. 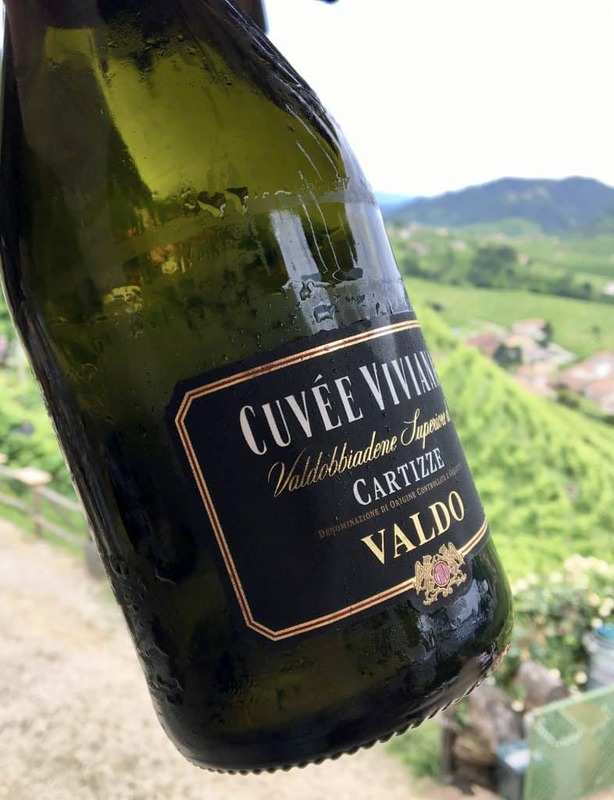 Making top quality Prosecco is an art that is taken very seriously, and quality is the most important facet for Valdo. 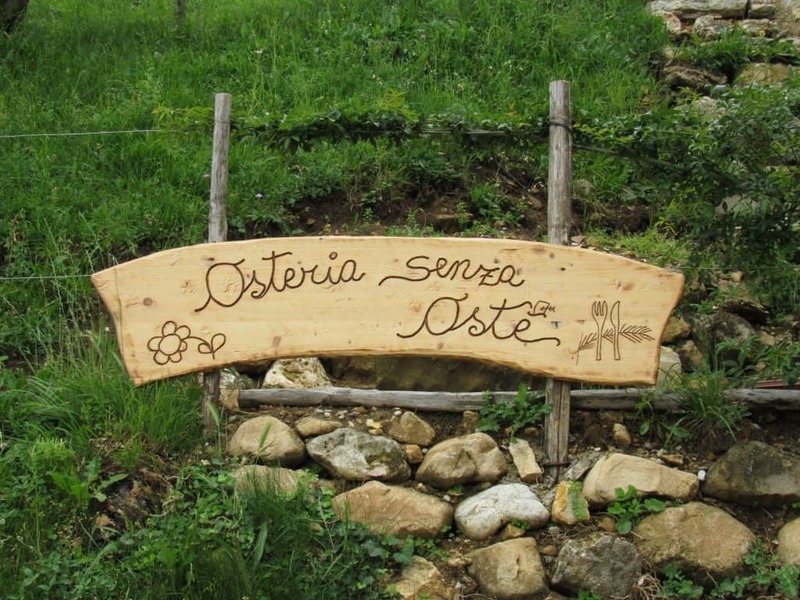 In the midst of the Valdo vineyards was a three story 19th century farmhouse called “Osteria senz’Oste”. This basically translates to a hosted tavern without a host. It doesn’t translate well into English, to be honest. At this establishment, there is no one to serve you. You serve yourself and leave the money in a box. 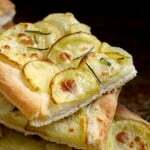 There is usually a selection of salumi, cheeses, wines, and desserts to choose from. How lovely is this idea? 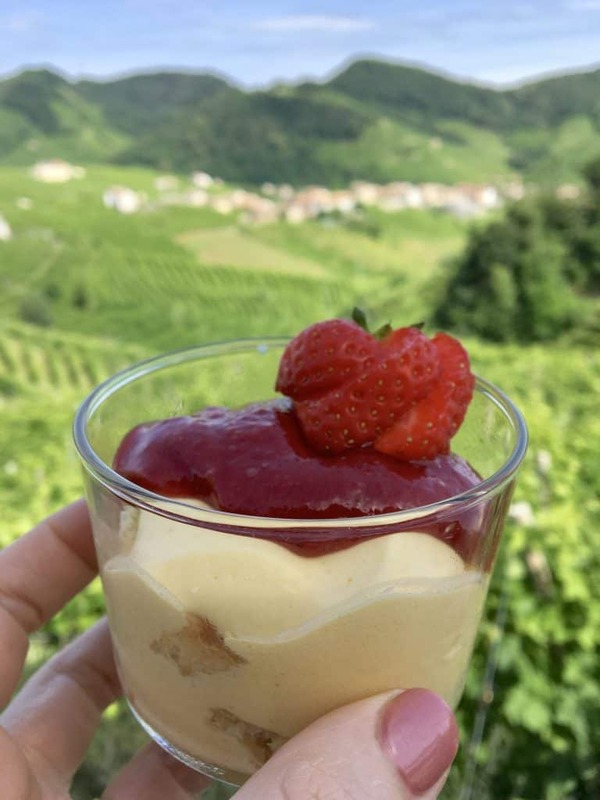 Another reason for a day trip to Valdobbiadene! Everything was so rustic and incredibly photogenic. It’s really difficult for me to narrow down which photos to share with you, again! Paolo leading us for more Prosecco! We walked along a path and went upstairs. This was the view. The photos honestly cannot do it justice. Here’s a little clip of Paolo masterfully opening a bottle of Prosecco to pour for us, along with the vineyard view. As we were leaving, the clouds decided they would leave, too! The views only became better. 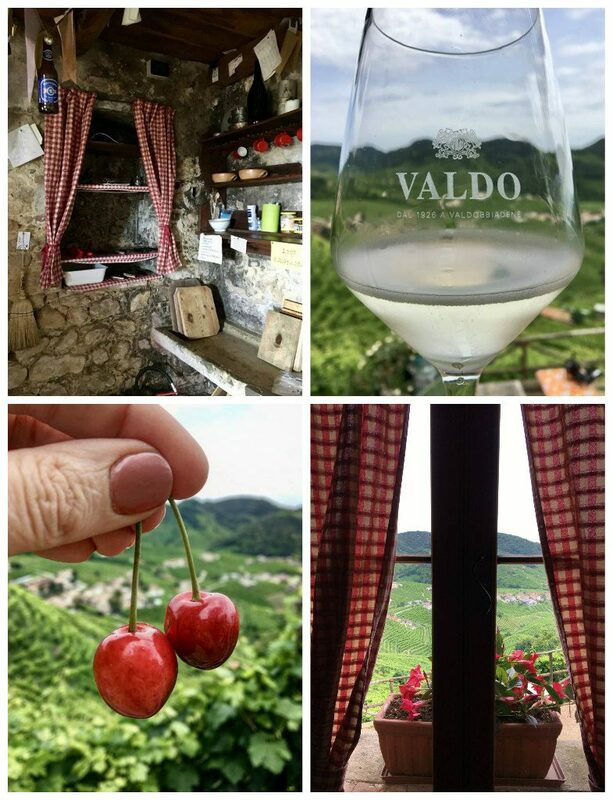 Are you adding a day trip to Valdobbiadene to your bucket list yet? We could actually see this restaurant from the Osteria, so we arrived just a few minutes later. Again, the views were simply spectacular. And the food? It was all homemade from the best quality ingredients. 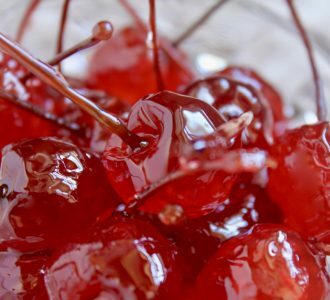 You can see and taste it. Here are some of the dishes we had. There was plenty of antipasti consisting of prosciutto (including a sheep prosciutto which I’d never had before), salami, cheese and bread. Of course, there was no shortage of Valdo Prosecco, either. L to R: my Mum, Caleb, Chloe, our driver (wish I could remember his name-ugh! ), Jasmine, Paolo and Gianfranco. Sheep prosciutto with Sardinian bread, cheese and a type of Italian chutney (it was called “orange mustard”). Baked polenta gnocchi with pieces of speck (ham) and sage sauce. 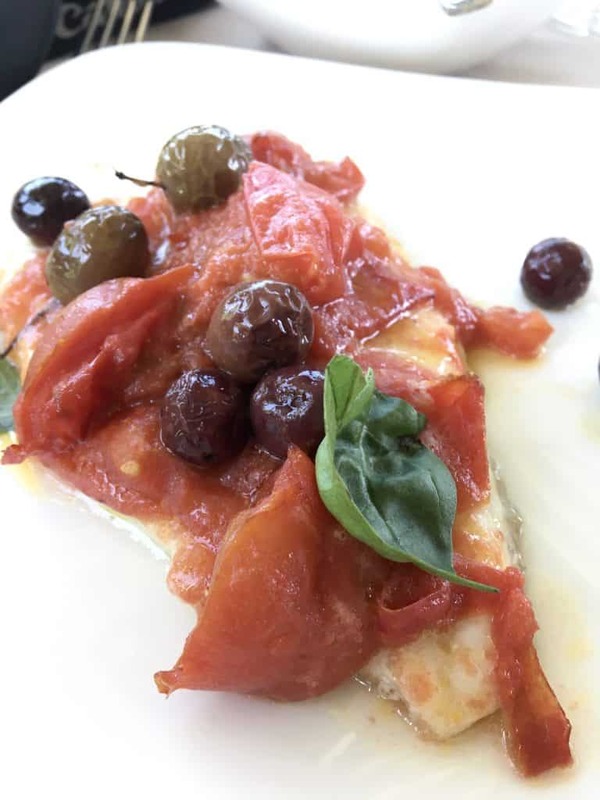 Baked turbot with tomatoes and olives. And to finish this delectable lunch, a dessert that could hold its own: strawberry tiramisu! The view! And look at the sky, now. After our wonderful lunch, we headed back to Venice. We even had time for a gondola ride before dinner! 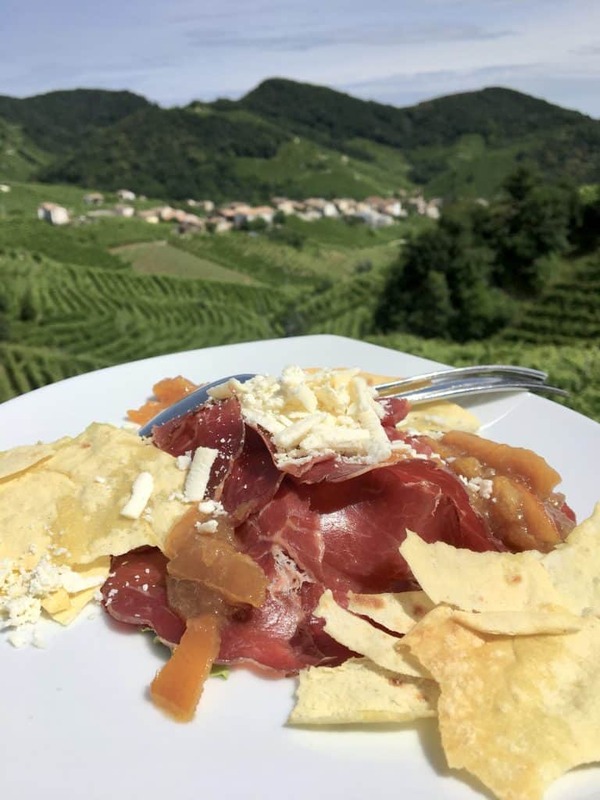 I know that some (maybe many) of you will be traveling to Venice at some time in the future, so I would strongly suggest that you add a day trip to Valdobbiadene to visit this little visited region. Somehow, I have a feeling you won’t regret it. I want to thank Paolo, Gianfranco and Jasmine for treating us like VIPs, and making us feel so welcome. 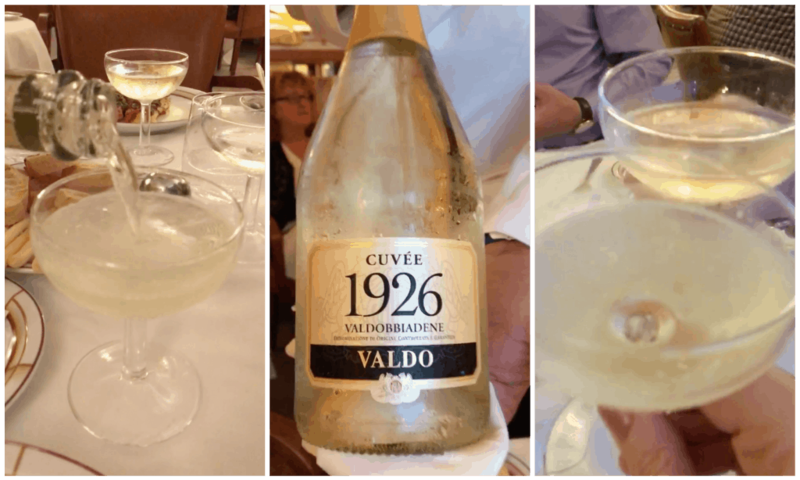 We loved having Valdo Prosecco with all of our meals. My family near Cassino appreciated the bottles I brought to share with them when we visited! 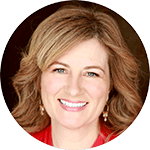 Grazie mille per tutto – I promise to practice my Italian! This is a great video that shows the area that we visited. Click the photo to watch the clip. You can find more information on Valdo’s beautiful site. 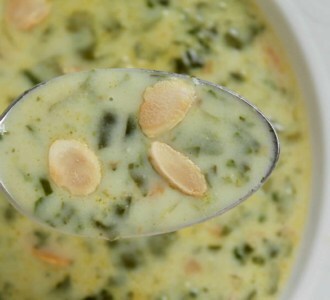 Have you seen or heard of Valdo before reading my post? 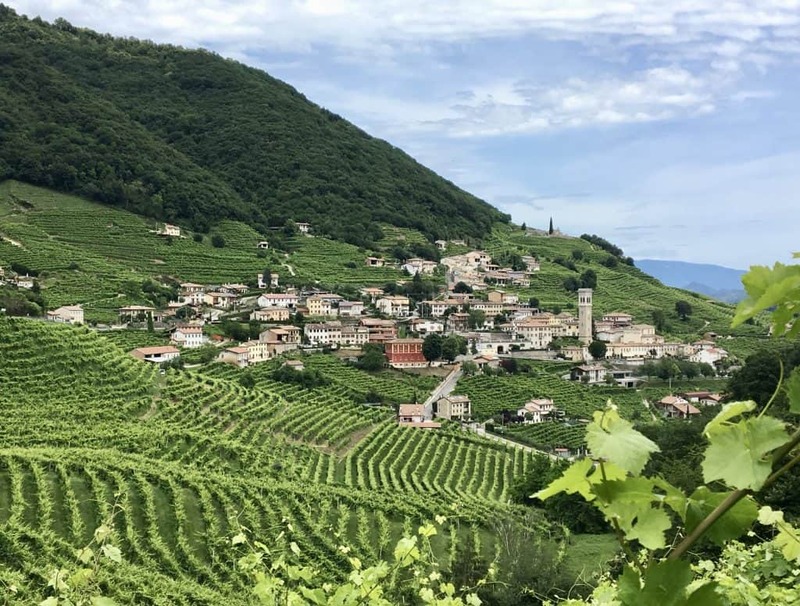 Can you properly pronounce Valdobbiadene, yet? 😎Let me know in the comments below. 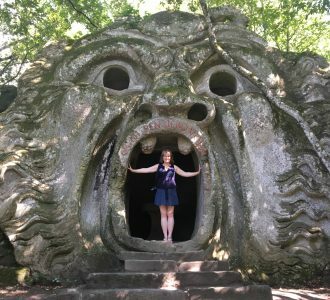 Christina, I can’t tell you how thankful I am to have found your blog and all of your recommendations for things to do and see in Italy! 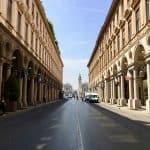 My husband and I are going to visit Italy for a month this summer and I am putting all of your tips, tricks, and favorites into my spreadsheet! THANK YOU! Oh that’s awesome Sydnie! I’m so happy you let me know! Stay tuned as I’m going to be sharing more of that trip (I haven’t had time to post the rest of my trip)! 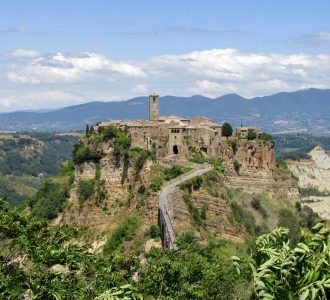 We also went to San Gimignano (was too touristy for me), Orvieto (loved it), Civita di Bagnoregio (HIGHLY recommended) and many more places! Wow! Looks so fun, educational, and exciting. And the views are all stunning. 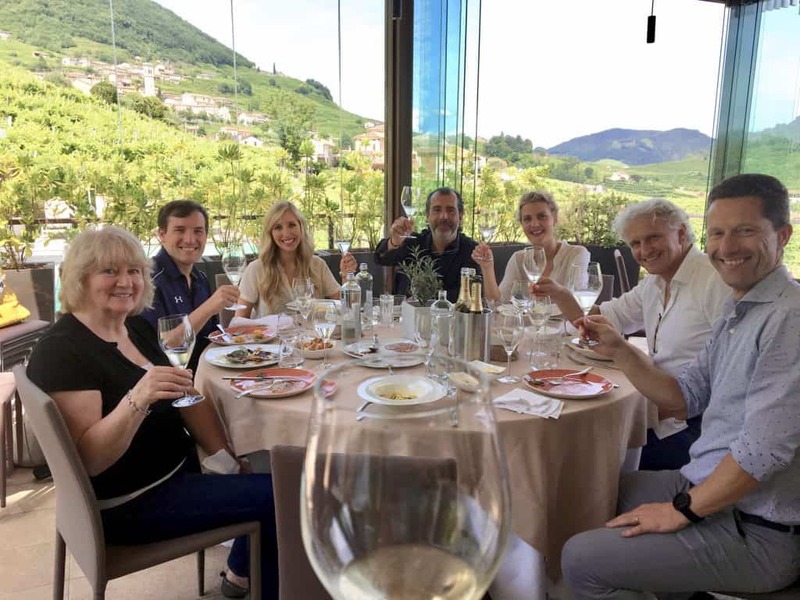 What a special trip to visit the vineyards of this fantastic prosecco! Thank you for sharing a bottle (or two) with me! That carbonara has my name on it! You’re so welcome, I wish we could do that more often! What stunning photos and compelling story. I really enjoyed every step of your journey. 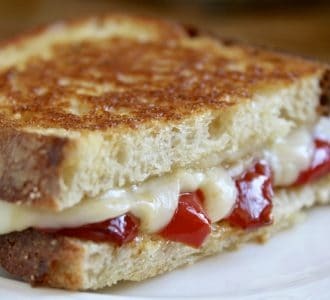 I will need to add this to my culinary bucket list. Job well done Christina! Amazing! How was the sheep prosciutto? Polenta gnocchi….. the picture speaks for itself. amazing!!! The sheep prosciutto was better than I expected, however, pork prosciutto is still the best. Polenta gnocchi were really tasty; I liked the texture and the sage flavor with them. Yes, nothing was disappointing, Marie! Oh, so beautiful- the land, the food an, fuguriamoci, the prosecco! 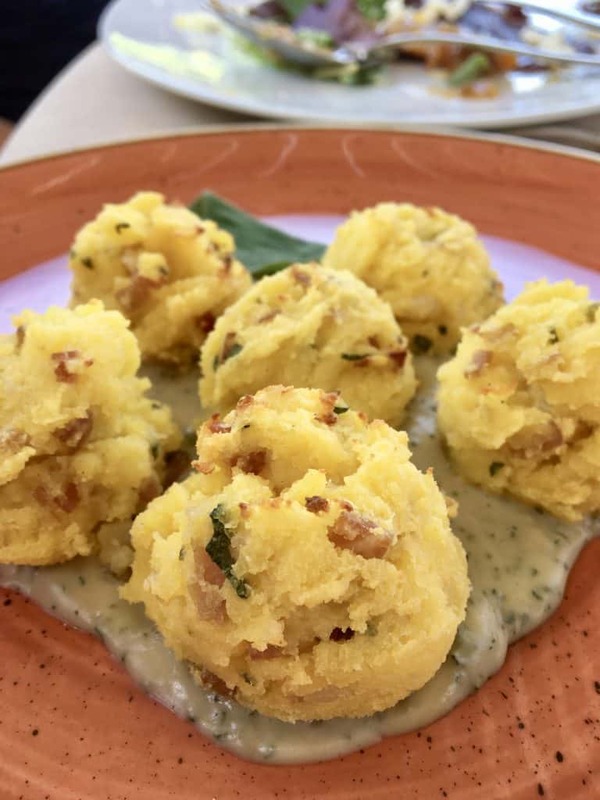 Those little polenta cakes with the sage sauce… yum! Glorious vineyards. Love the panoramic views! It was absolutely the most fabulous day! Your photos are incredible!!! 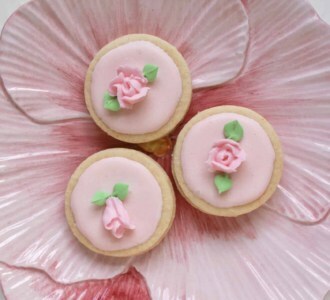 I’m rereading your blog for the second time this evening … just absolutely beautiful writing and photos! You are much too kind, Sue! Thank you so much; I’m so glad you enjoyed it! 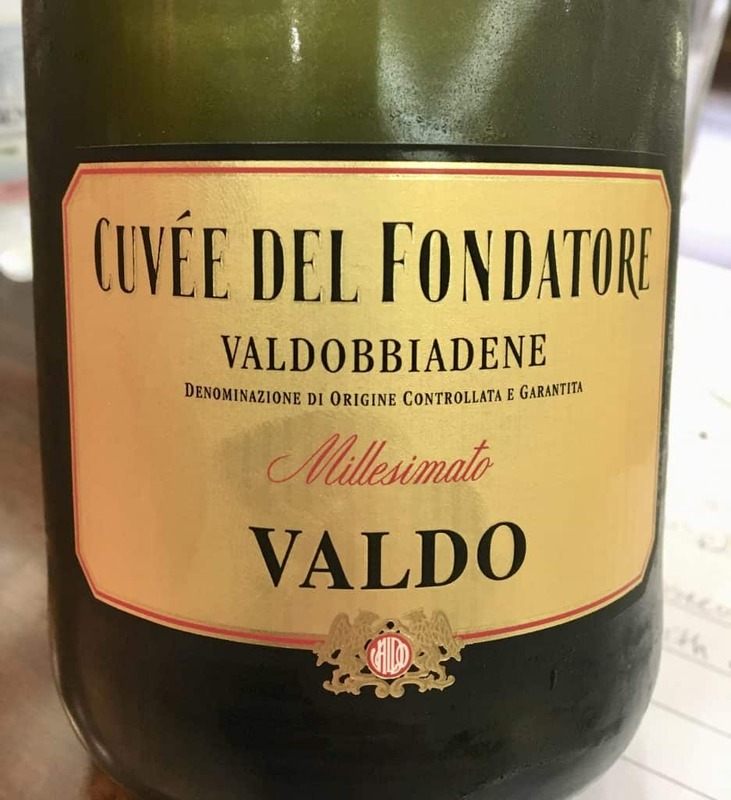 Couldn’t you just say that name, Valdobbiadene, all day long? So poetic!! You wrote a beautiful article, Christina. As a lover of all things Prosecco, including Aperol Spritz, this tour will have to be on my bucket list for next trip. 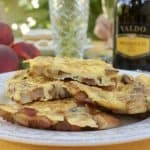 Valdobbiadene…Valdobbiadene…Valdobbiadene. What a beautiful language. This is so funny, Mike, simply because I actually had to keep saying it over and over again to say it correctly! I kept stressing the wrong part of the word and would forget the proper way to say it! Now, I can’t say it incorrectly anymore and forgot how I was mispronouncing it! I must have asked everyone to repeat it for me about 8 times! I’ve never had such a block on a pronunciation before. Thank you so much for your compliment! I’m so happy it’s now on your radar! You’d just love it there, I’m sure of it! Have a lovely evening!